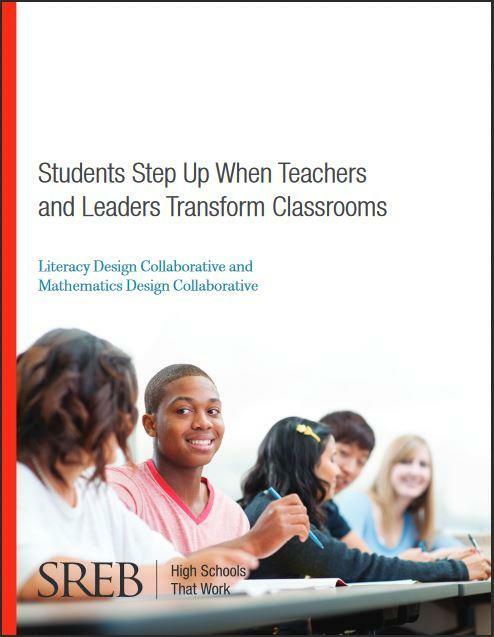 When you think about it, LDC (Literacy Design Collaborative) and MDC (Mathematics Design Collaborative) are just good instruction, according to Bryant Gillis, principal of Tichenor Middle School (TMS) in Erlanger, Kentucky. To make that good instruction pervasive across content areas and grade levels, TMS partnered with the Southern Regional Education Board and the Kentucky Department of Education to make building literacy-rich instruction an essential part of the school culture. 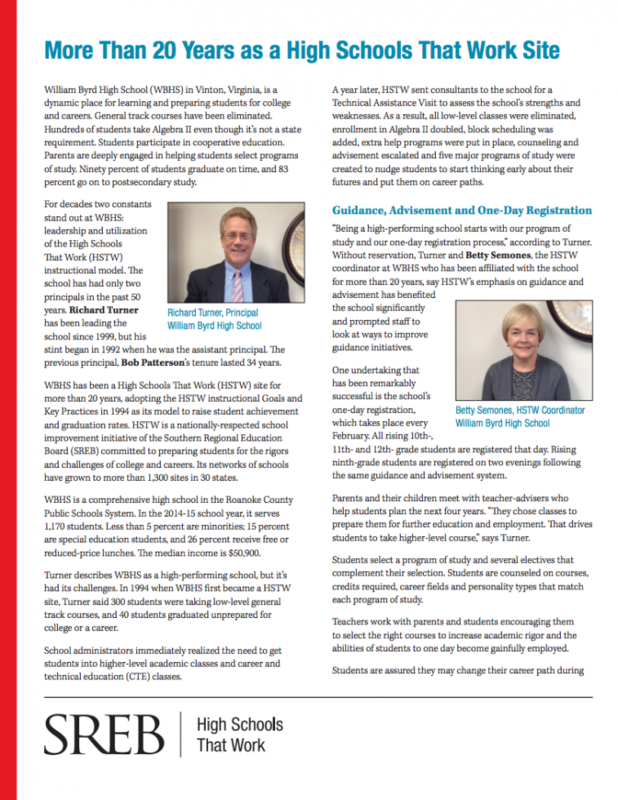 William Byrd High School (WBHS) in Vinton, Virginia, is a dynamic place for learning and preparing students for college and careers. General track courses have been eliminated. Hundreds of students take Algebra II even though it’s not a state requirement. Students participate in cooperative education. Parents are deeply engaged in helping students select programs of study. Ninety percent of students graduate on time, and 83 percent go on to postsecondary study. Queens Vocational and Technical High School (QVTHS) serves a culturally diverse student population of 1,200 students from across New York City. The school is a part of a cohort of New York City schools that were awarded a United States Department of Education grant to reorganize into small learning communities (SLCs). 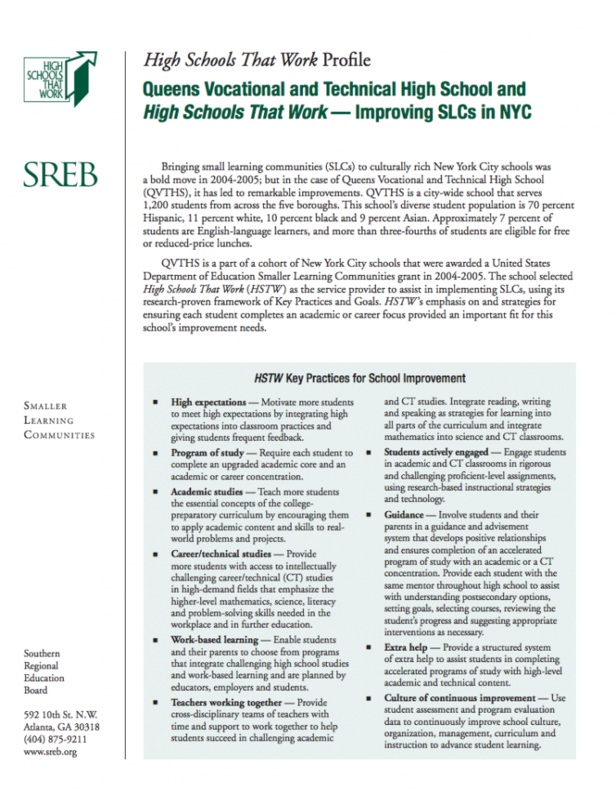 This profile explains how QVTHS used theHigh Schools That Work framework not only to organize into effective SLCs but also to implement a variety of improvement efforts to ensure success for all students. Warren Easton Charter High School in New Orleans, Louisiana, has weathered changes of many types, including Hurricane Katrina in 2005. After having to close for the 2005-2006 school year, the school reopened as a charter school with a board and stepped up its efforts to raise student achievement. Now the school is receiving attention for the academic successes of its 100 percent minority student body. 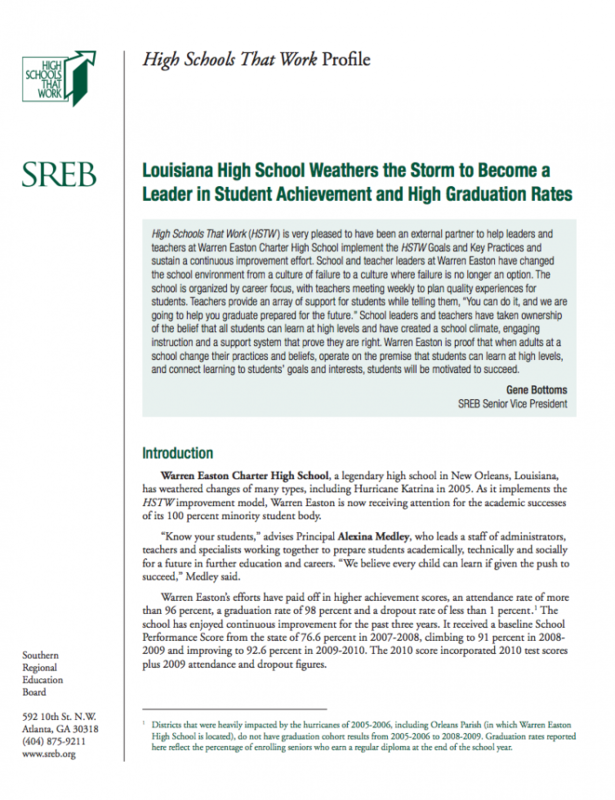 This profile describes how Warren Easton has implemented the HSTW improvement model to realize higher achievement scores, an attendance rate of more than 96 percent, a graduation rate of 98 percent and a dropout rate of less than 1 percent. 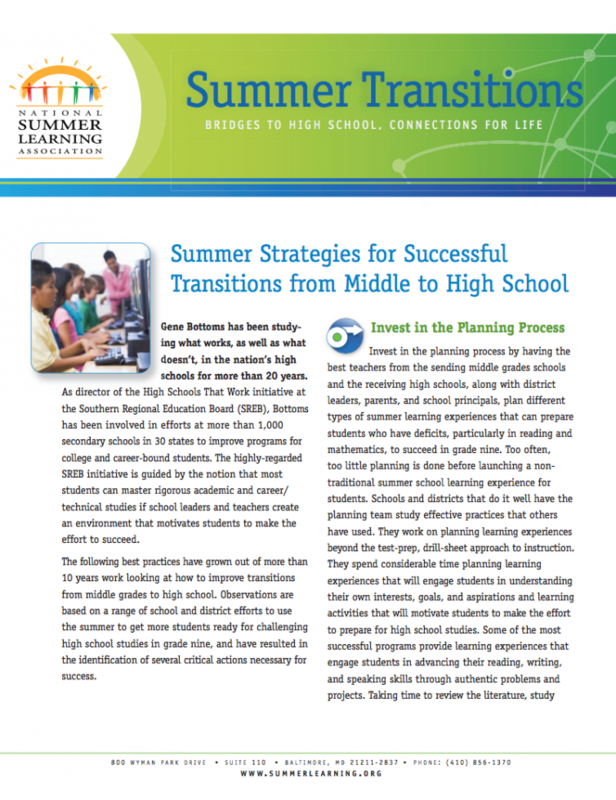 This article describes best practices in summer transition programs, identified through more than 10 years work looking at how to improve transitions from middle grades to high school. 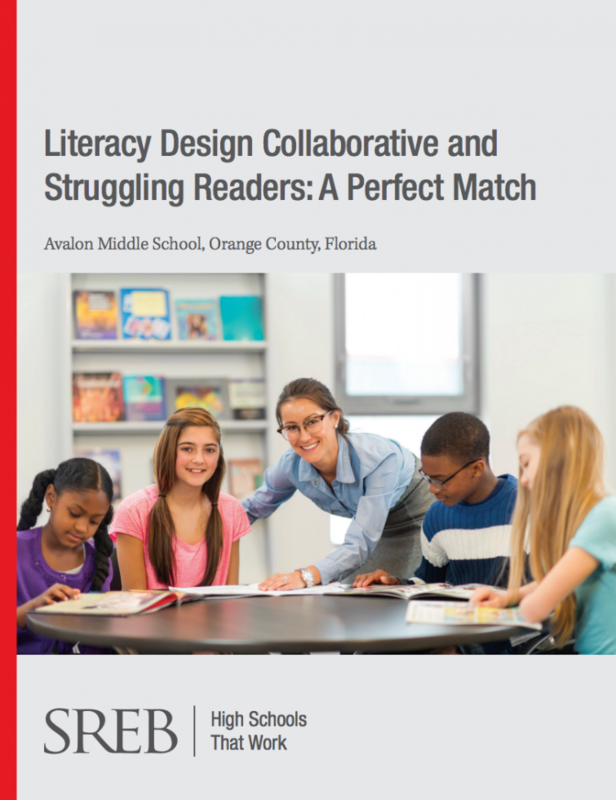 Observations are based on a range of school and district efforts to use the summer to get more students ready for challenging high school studies in grade nine, and have resulted in the identification of several critical actions necessary for success.